THERE'S MORE TO THE MOOD-BOOSTING PROPERTIES OF EXERCISE THAN ENDORPHINS. Exercise has been touted to be a cure for nearly everything in life, fromdepression, to memory loss, Alzheimer’s disease, Parkinson’s and more. At the same time, similar to the topic of sleep, I found myself having very little specific and scientific knowledge about what exercise really does to our bodies and our brains. WHAT TRIGGERS HAPPINESS IN OUR BRAIN WHEN WE EXERCISE?Most of us are aware of what happens to the body when we exercise. We build more muscle or more stamina. We feel how daily activities like climbing stairs becomes easier if we exercise regularly. When it comes to our brain and mood though, the connection isn’t so clear. 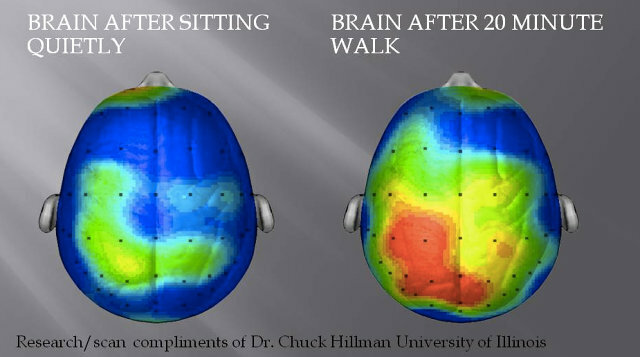 If you start exercising, your brain recognizes this as a moment of stress. As your heart pressure increases, the brain thinks you are either fighting the enemy or fleeing from it. To protect yourself and your brain from stress, you release a protein called BDNF(Brain-Derived Neurotrophic Factor). This BDNF has a protective and also reparative element to your memory neurons and acts as a reset switch. That’s why we often feel so at ease and things are clear after exercising and eventually happy. So, BDNF and endorphins are the reasons exercise makes us feel so good. The somewhat scary part is that they have a very similar and addictive behavior like morphine, heroine or nicotine. The only difference? Well, it’s actually good for us. Now, that’s all nice to hear you might say, starting to exercise regularly or even daily is still easier written than done. At end of the day, there is quite a lot of focus required to help you get into the habit of exercising daily. The most important part to note first, is that exercise is a “keystone” habit according to Charles Duhigg, New York Times bestselling author of The Power of Habit: Why We Do What We Do in Life and Business. This means that daily exercise can pave the way not only for happiness, but also growth in all other areas of your life. By 9:30am, I’ve done an hour of coding on the most important task I have right now on Buffer, I’ve been to the gym and had a great session, and I’ve done 30 minutes of emails. It’s only 9:30am and I’ve already succeeded, and I feel fantastic. This technique sounds rather simple, but has been one of the most powerful ones. If you put everything the way you want it for the gym before you go to sleep and put your alarm under your gym clothes, you will have a much easier time to convince yourself to put your gym clothes on. Track your exercises and log them at the same time after every exercise: When you try to exercise regularly, the key is to make it a habit. One way to achieve this is to create a so called “reward”, that will remind you of the good feelings you get from exercising. In our big list of top web apps, we have a full section on fitness apps that might be handy. Try out Fitocracy or RunKeeper to log your work-outs. Try to have a very clear logging process in place. Log your work-out just before you go into the shower or exactly when you walk out of the gym. Think about starting small and then start even smaller: Here is a little secret. When I first started exercising, I did it with five minutes per day, three times a week. Can you imagine that? Five minutes of timed exercise, three times a week? That’s nothing, you might be thinking. And you are right, because the task is so easy and anyone can succeed with it, you can really start to make a habit out of it. Try no more than five or 10 minutes if you are getting started. There are lots more great ideas for how you can create a habit from Joel in his post on the exercise habit, be sure to check it out, it might be a lot of help here. I am sure that if you dedicate just very little time, you can get into an awesome exercise routine that makes you happier, more productive and relaxed than ever before. So this means that if you have never exercised before or not for a long time, your happiness gains will be the highest if you start now. Exercise and how it affects our level of happiness is an absolutely exciting topic for me. Have you played around with this too and seen any results? I would love to hear your thoughts on how exercise and happiness work together. → Leo Widrich is the co-founder of Buffer, a smarter way to share on Twitter and Facebook. Leo writes more posts on lifehacks, efficiency, and customer happiness over on the Buffer blog. Hit him up on Twitter @LeoWid anytime; he is a super nice guy.